Come celebrate Arizona Golf Day at Chase Field on Saturday, April 13 to watch your D-backs take on division rival San Diego Padres! We’ll have interactive golf-inspired activities located in front of the ballpark before you enter the gates. $5 from each ticket will benefit Junior Golf in Arizona. 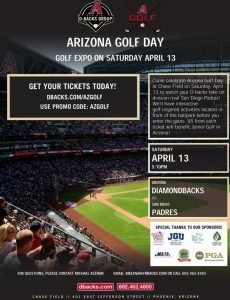 Visit www.dbacks.com/AZGolf and use offer code: AZGOLF to get your discounted tickets today! For questions, contact Michael Keenan at mkeenan@dbacks.com or (602) 462–4265.